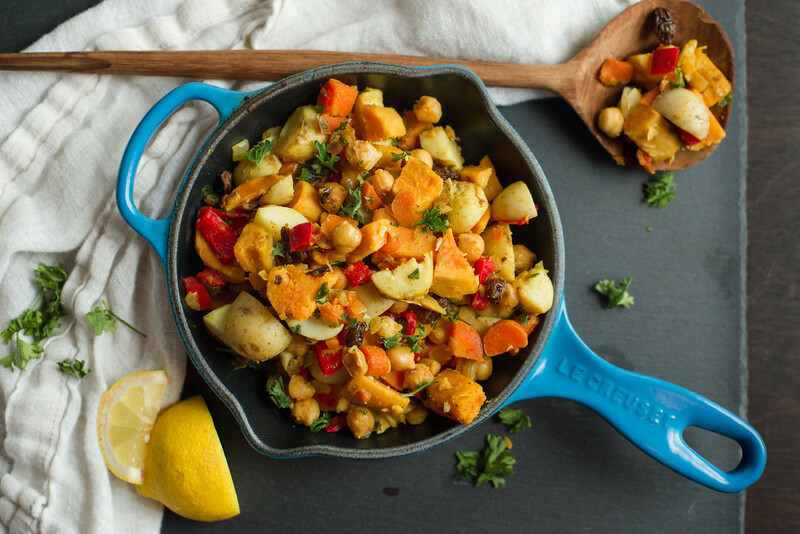 This is a Moroccan inspired Warm Potato Salad recipe we found in Mark Bittman’s VB6 cookbook. Our friend Jen Miller modified this to include sweet potatoes as well, which really enhances the dish. Put sweet and white potatoes in a pot and cover with water. Bring to a boil. Cook until tender (about 15 minutes), then drain and place in large bowl. Rinse and drain the chickpeas. Heat 2 tablespoons of the olive oil in a skillet on medium-high. Cook onions, carrot and ginger, and bell peppers stirring occasionally until tender, about 5 minutes. Add chickpeas, raisins, cumin, turmeric, cinnamon, pepper, salt and cayenne (optional). Stir until fragrant about 2 minutes. Add veggies and spices to the potatoes, along with lemon juice, parsley and remaining olive oil. Stir until combined, breaking up the potatoes slightly. Adjust seasoning to taste and serve warm or cold.